The Nova XL is a patent pending design ideal for those facilities with the floor space to provide countless amount of functional fitness exercises. Our patent design of the Nova XL is infinitely expandable for creating modular XL bridges stacked sid-by-side or end-to-end to create the size and training options needed for functional fitness, obstacle course, calisthenics, and ninja warrior style of training! Staggered height monkey bars- Adjust monkey bars at different height for more challenge. Our newest NOVA configuration offers in-line training features plus storage that allows for it to be mounted along a wall and free-standing without any need to anchor to the wall. More open floor space with overhead anchor points to accommodate all types of suspended fitness accessories. Different anchor point heights for Suspension trainers, Yoga hammocks and Silks, Climbing ropes, Rings, Heavy Bags, Grip strength tools, and more! Lower bridge support options for more training features, Pull-up bars, Cliff Hanger feature, and Globe Grip Rail for the famous Ring Toss exercise! Customize with the options and accessories you need! Modular design allows for multiple bridges to be added and grow the ultimate Functional Training Station! The 4 corner uprights offer a variety of exercise options allowing customers to create the Nova XL Arch bridge specific to the training needs. A variety of training and fitness storage options at each corner of the XL bridge! See The NOVA XL in action! Customize with the features you choose. ROPE LADDER - is part of the Stall Bar center section of the NOVA™ FTS. A pair of oversized tube 7' training rope ladders for varied rope pull exercises. ADJUSTABLE DIP and STEP - NOVA FTS™ feature for pillars. Solid and stable dip and step platform to choose as pillar add-ons. 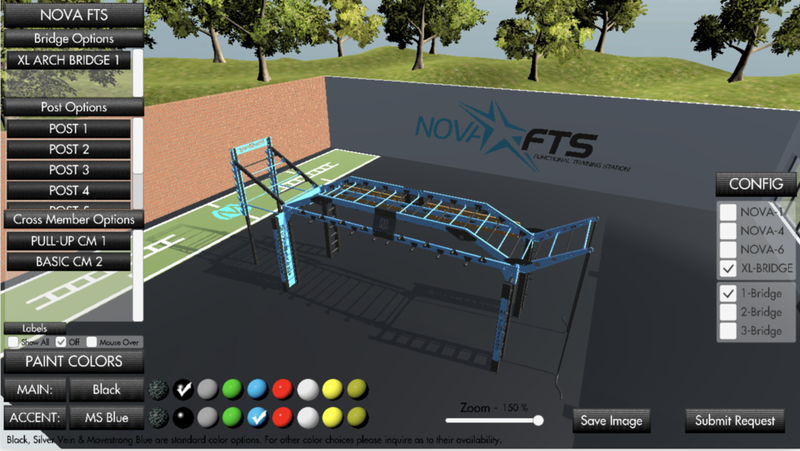 A new feature available for the Nova Functional Training Station by MoveStrong. A 10' span horizontal bridge of monkey bars can be added to any side of the NOVA FTS. The monkey bars can placed at varied heights to offer staggered climbing of bars. CLIMBER BARS - NOVA™ FTS center section feature. 4-tiered bars for climbing and bodyweight exercises. Provides high anchor point for climbing ropes and rings as well. Patented Accessory Track System is ideal for use on the MoveStrong Nova FTS models. Attach fitness accessories such as resistance bands, heavy bags, suspension trainers, grip tools, Yoga hammocks, and more. 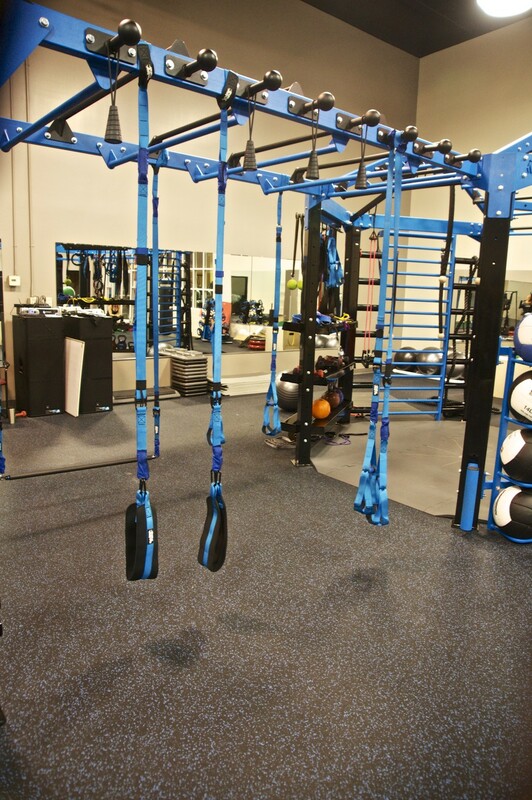 Slide along a track, lock-in-place, and move when need to open up training space on the rack. NOVA™ Patent Pending Free Sliding Fitness Anchor in action with Battle Ropes. Use the sliding anchors to attach ropes and bands. A number scale on plate for user feedback. SLIDING PULL-UP - for unrestricted pull-up variations with free sliding and rotating handle. ARCHED MONKEY BAR BRIDGE - NOVA FTS™ bridge feature. Choose the arched bridge or horizontal bridge for climbing and bodyweight exercises. The revolving pull-up bar is a challenging way to work grip and upper body strength. Train like a ninja warrior with the never-ending climb challenge! Visit our NinjaStrong page of more optional training features designed for Ninja Warrior Training!